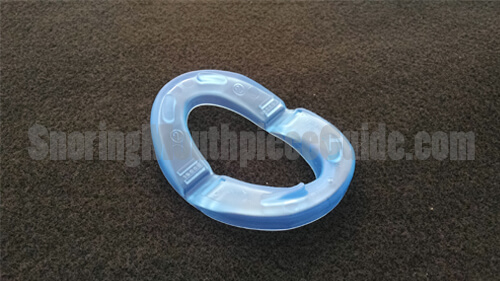 ZQuiet is a Mandibular Advancement Device that is constructed of a soft rubber-like material. It is used to hold the lower jaw forward in order to widen the airway, allowing air to move freely and prevent a restriction in flow. The actual material used in the construction is a thermoplastic elastomer which contains no BPA’s nor latex. It functions similarly to other MAD devices on the market with the exception of the fact that it is hinged at the jaw (named “living hinge” technology by the manufacturer). This allows free movement of the mouth, allowing you to speak and even enables you to take a sip of water without removing the device. This open design is essential for those who breathe through their mouth while sleeping. According to the manufacturer, this device is expected to last for several months when used on a regular basis. This MAD can be used right out of the box although some customization may be required in order to achieve optimal performance. The zQuiet is offered on a 30-day trial basis, meaning that if you can give it a try before committing to the full asking price. The trial cost is $19.90, which includes shipping and processing. 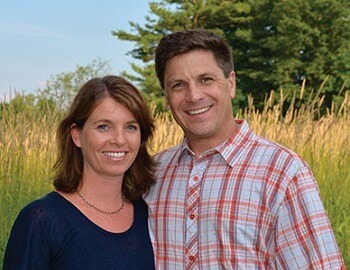 In 2008, couple Dan and Katrina Webster developed the ZQuiet snoring mouthpiece in order to solve a common problem that they both shared – snoring. Their company, Sleep Well LLC was registered with the state of Vermont in 2008. In order to gain some credibility, they recruited Avery Lieberman, DDS who for more than 20 years has worked in the sleep medicine field. While in practice, his focus was on sleep apnea, snoring and oral appliances. Lieberman helped Dan and Katrina to develop the ZQuiet. In the past, I have tried out several boil and bite mouthguard type devices in an attempt to treat my snoring. 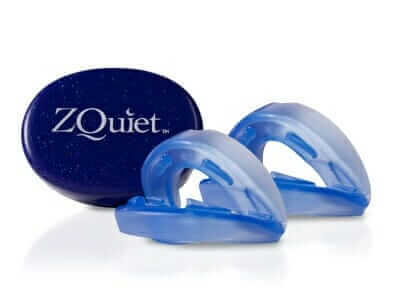 While just about every product that I have tried did in fact work, I was excited to try out the ZQuiet because it appeared to be much thinner than your typical self-fitted boil and bite mouthguard. I placed an order on their website and received my package in the mail containing my new device. From the time that I ordered it until it arrived in the mail took about 3 days, so it was reasonably fast. 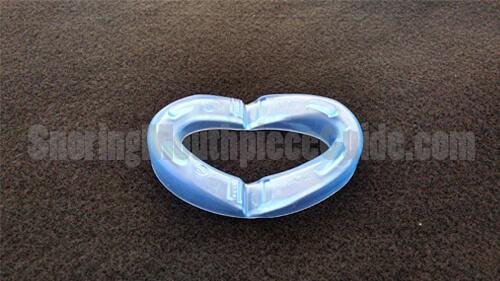 As I unpacked it the first thing that I noticed was that as suspected, it was in fact much thinner and more compact in comparison to the traditional thicker mouthguard style devices that I have tried in the past. After glancing over the instructions I gave it a quick bath using dish soap and warm tap water. The warm water seemed to relax the spring action of the hinges a bit and gave it a softer feel. I popped the device into my mouth and it seemed to fit naturally and was quite comfortable. The instructions do say that you can use a small pair of scissors to trim any extra material if needed but this was not necessary for me. I left it in for a few minutes to get a feel for it and started to notice drool coming out of the side of my mouth. Having used a mouthpiece before, I understood that this usually happened whenever introducing a new device into your mouth. 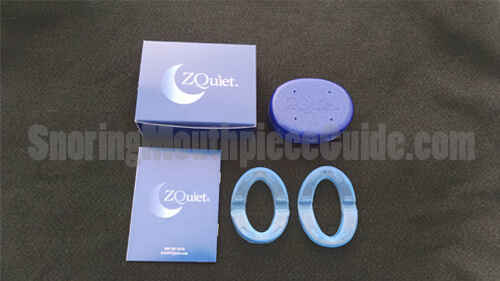 Before going to bed I placed the ZQuiet into my mouth and laid down. The familiar feeling of salivation began but soon stopped after leaving it in for a few minutes. After getting over the excessive salivation it was nearly effortless to wear. I was able to close my mouth almost all the way with the exception of a couple of millimeters due to the airflow posts. The overall thickness was much less distracting in comparison to other thicker units that I have tried. Now it was time for the trial with my wife being the judge. She’s a night owl and typically stays up a couple hours past my bedtime. By the time that she’s ready to go to bed, I am usually snoring like a freight train. She listened as I fell asleep and… guess what? This small device seemed to have alleviated my snoring. The next morning I woke up and removed the device from my mouth. My lower jaw had an undeniable sore feeling as if it were held forward for the entire night. In reality, that’s exactly what all mandibular advancement device do. They hold the lower jaw forward which tightens the muscles in your throat and keeps the airway clear. I knew from past experience that this feeling usually goes away. In the morning I gave my mouthpiece a rubdown with dish soap and then rinsed it off with warm water. The manufacturer suggests that you store it flat in the provided case so this is what I did after allowing it to dry. It was time for round two and with good results the first night I was excited to replicate my experience. Once again I rinsed it off under warm tap water and then placed it into my mouth before going to bed. This time there was there wasn’t much of a salivation issue so that was good. Without hesitation, I fell asleep and once again received a positive report from my wife in the morning. The morning time soreness feeling was still there and lasted a couple hours after removing it. For the next 12 nights, I used the ZQuiet with fantastic results. After a total of 2 weeks of quiet snoring, I have concluded that it does, in fact, work on a long-term basis. After day 3 or 4 the morning time soreness diminished and eventually became unnoticeable. Also, the drooling problem went away after a couple of night. I slept like a rock and my wife was also satisfied with the results as she was also able to sleep. Overall my experience was better than average in comparison to other devices that I have tried in the past. It worked comfortably right out of the box and did not need to be heated in boiling water. The hinged joint was a great feature which made it feel “natural” and allowed me to breathe through my mouth while allowing my jaw to move freely. I really enjoyed the fact that it’s compact and doesn’t make you feel like there is a rubber sanding block in your mouth. Overall, users who have tried this device have reported positive results. 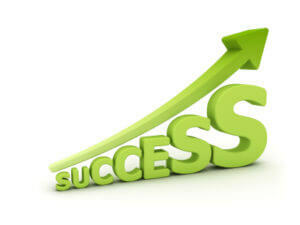 The companies website reports a 94% satisfaction rate. Most say that this device works on the first night. It seems as if the product delivers as promised. There are of course some side effects that are less commonly reported including drooling, sore jaw, and inability to keep the device in all night. I found a couple of comments from people who said that the device initially fell out when rolling over. These are common side effects that are not exclusive to the ZQuiet. Side effects such as jaw soreness and excessive drooling typically subside within a couple days to a week. As previously mentioned, there is a 30-day trial which you pay $19.90 for the which includes shipping and processing. Once 35 days have passed, your credit card will be charged $79.95. 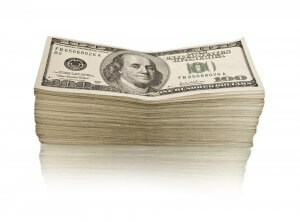 If you decided to keep it, the overall cost is approximately $99.85. If not satisfied, the manufacturer will allow you to return the product within 30 days after receiving it and your card will receive no further charges on your card. With so many antisnoring devices available on the market, it comes down to functionality, unique features, safety, and cost. From my own findings, I was able to confirm several reports of the ZQuiet working on the first night and every night thereafter. Because there is no initial fitting process required I simply rinsed it off under hot tap water and put it to use immediately. This product did an excellent job of treating my loud snoring that often keeps my wife up at night. Most traditional boil and bite style oral appliances place your jaw in the forward fixed position, preventing you from speaking or drinking. 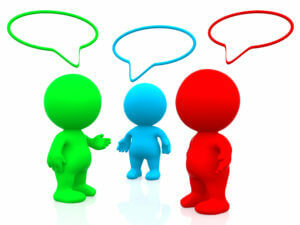 The ZQuiet addresses this issue with their “living hinge” technology. The airflow posts prevent the device from completely closing which is an important feature often overlooked by those who have a tendency to breathe through their mouth while sleeping. Being made from a very soft rubber-like material makes it easy on the gums preventing irritation. Also, there are no sharp edges to poke at the inside of your mouth. 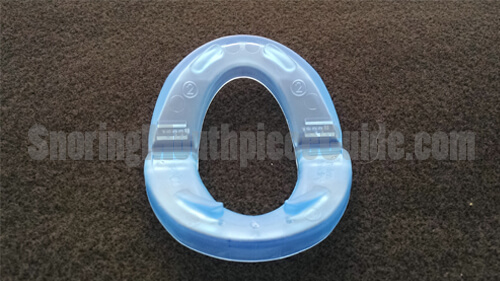 It fits comfortably around your teeth and features a compact design that is amazingly effective. 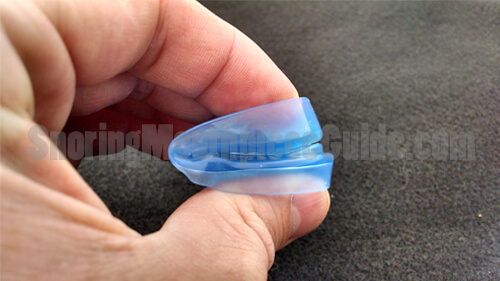 Safety should be a high priority for anyone shopping for a snoring mouthguard. The manufactures of the ZQuiet have taken all of the necessary steps in order to ensure that their product is safe to use. Being regulated by the FDA and also latex and BPA free gives them a competitive advantage over other products that could be made of questionable materials which may contain harmful toxins. There is an alarming number of mouthguard product being sold that do not meet these requirements. The total cost comes to around $100 which is the average price one should expect to pay for a quality OTC oral appliance. 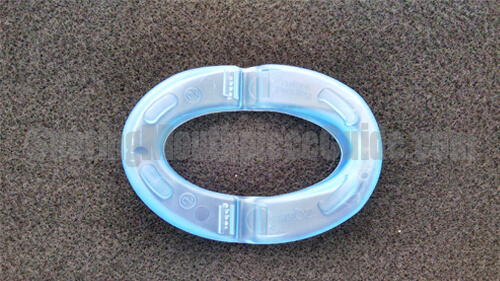 There are numerous other devices available that sell for nearly half this cost, however, they are almost always your simple boil and bite mouthguard style units which are fairly thick and take up quite a bit of room in your mouth. ZQuiet has covered all of their bases with a unique and safe product that performs well and lives up to its expectations. While you may be thinking “$100 for a simple piece of plastic” the fact that it’s one of a kind, safe and effective makes it worth its weight in gold. Having all of these features and seeing the ZQuiet in action has convinced me that it is perhaps the best OTC mandibular advancement device on the market today. Considering all factors, the ZQuiet gets my personal recommendation. It is important to keep in mind that your results may vary. 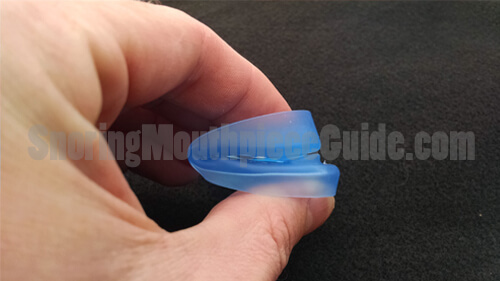 The anti-snoring mouthpiece is one of the most highly effective snoring treatment solutions available. With over 100 different products to choose from, deciding which one to buy can be challenging. 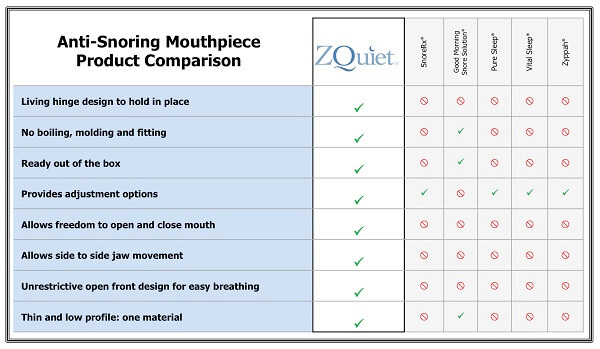 As for the ZQuiet, like several another mouth high-performance medical device, this product is available at the ZQuiet website or from select dentist and physicians. Rx Only.